My friends and I are still talking about ancestral homes and I am still amazed at how floors and walls could stand for centuries just because of the design of a house. 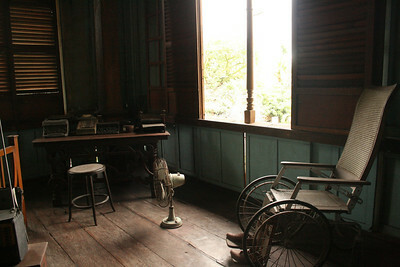 After all, in Balay Negrense, there is a sign saying that it's the great ventilation that allowed the house to breathe and protected it from decay. And I wonder, are there people building homes with that in mind? Or are they all just going for concrete floors to void issues like rotting wood and termites? Anyway, I have been on the site of the The Flooring Pros Flooring America for a while now, just drooling over the hardwood floors (love the hickory and maple floors!). The wood laminate flooring options they offer is also not bad, and yes, a lot cheaper! This reminds me... we still have to troop over to Laong Laan and see if we can salvage some antique wood there for the boys' study table. Hopefully, we can get a door or floor and get that converted into a sturdy table at a price we can afford. And I really hope there will be a greater intiative of salvaging wood from run-down properties... and more builders will make use of recycled/reused materials. Not only is it cheaper, it's also green.